On-demand Interactivity with Cold War Kids The ultimate real-time remix experience has arrived. Four band members get on stage with each one holding an instrument. Now they’re waiting for you — yes, you, the audience — to decide who will play or sit out, which instruments will play together, and when all these shifts happen. Feel a bit like a puppet master yet? Well, that’s exactly the premise behind the music video for “I’ve Seen Enough” by Cold War Kids, directed by talented Wilco documentarian, Sam Jones. In this super interactive video the audience is in the driver’s seat of controlling each of the musicians sitting in the dark on stage. What’s especially impressive is that any element of the song can be mixed together at any point, without skipping a beat. Click on the band members and you can mute and unmute them. Click on the colored tabs above the musicians and you change the instrument they’re playing. There is an endless amount of remix control which leaves the whole music video experience open-ended and with tons of possible permutations. Start with an instrument, add a band member, tinker with pressing pause and play, and you can now call yourself a director and producer. Go ahead, give yourself a solid pat on the back! The ultimate real-time remix experience has arrived. 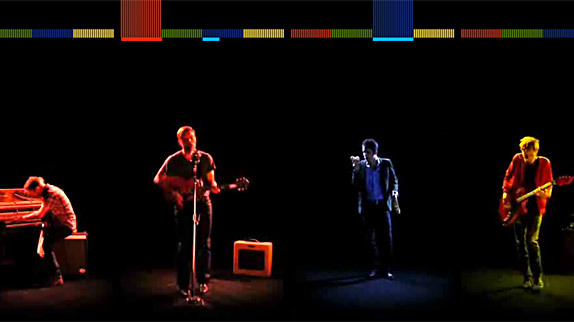 Four band members get on stage with each one holding an instrument. Now they’re waiting for you — yes, you, the audience — to decide who will play or sit out, which instruments will play together, and when all these shifts happen. Feel a bit like a puppet master yet? Well, that’s exactly the premise behind the music video for “I’ve Seen Enough” by Cold War Kids, directed by talented Wilco documentarian, Sam Jones. In this super interactive video the audience is in the driver’s seat of controlling each of the musicians sitting in the dark on stage. What’s especially impressive is that any element of the song can be mixed together at any point, without skipping a beat. Click on the band members and you can mute and unmute them. Click on the colored tabs above the musicians and you change the instrument they’re playing. There is an endless amount of remix control which leaves the whole music video experience open-ended and with tons of possible permutations. Start with an instrument, add a band member, tinker with pressing pause and play, and you can now call yourself a director and producer. Go ahead, give yourself a solid pat on the back! Interactive video clips on the web.